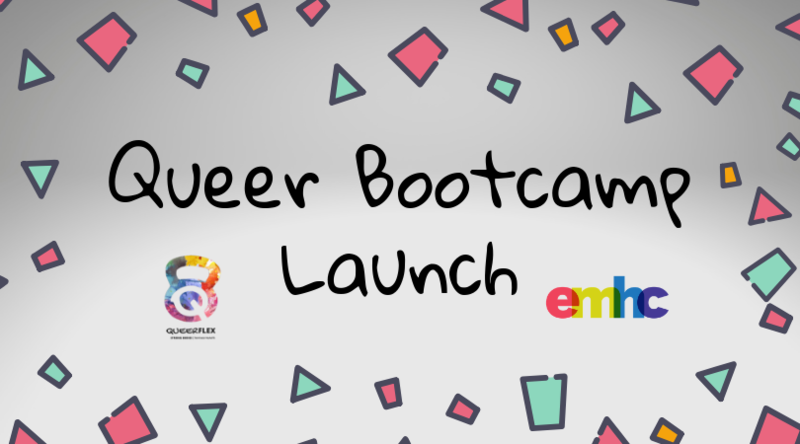 On October 23, 2018 our group fitness program relaunches as “Queer Boot Camp,” in partnership with Queerflex. To learn more about the program, what you can expect, and why it’s important, read on below! Why are you passionate about queer access to physical fitness? Kyle from QF: Fitness is political because it focuses on bodies; bodies are political because our society has made them that way. As a society, we politicize and police bodies to the point where many of us who live in what are considered “non-normative bodies” are often denied access to fitness spaces. This may not be a physical or intentional denial, but the narrative our society has built up around what kind of bodies are acceptable and worthy of care denies us on the bases where we simply feel as though we have no right to be in those spaces and take care of our needs. I am passionate about queer access to physical fitness, because queer, trans and nonbinary folks tend to have complicated relationships with our bodies as a result of this politicization, policing and othering, and I believe that if we can start to undo some of those narratives in a space so focused on bodies, that we have the potential to start undoing this narrative in other spaces of society, therefore enhancing queer access and liberation everywhere. Why is it important for Queerflex to exist? Kyle from QF: My own personal experiences with access to gyms and fitness spaces was what brought me down this path, but it was hearing from my fellow nonbinary pals and trans siblings, that I wasn’t alone in this, that really lit my fire about demanding, creating and advocating for accessible queer-centred fitness. Over the last two years, QUEERFLEX has empowered 100s of members from 2SLGBTQIA+ communities throughout our city, province and down into the states, to reconnect with their bodies and build a path to wellness that is accessible, sustainable and holistic. Connecting with one’s self in a holistic way further incites connection with one’s community, is foundational in building resiliency and moving from a place or surviving to thriving. QUEERFLEX facilitates this connection with self and community in a way that acknowledges and holds space for the intersections of our identities and traumas as 2SLGBTQIA+ people, promotes individual and collective healing and wellbeing. Who knew fitness could be so transformative? (Me. I did. And so did the hundreds of folks across North America have been doing this work long before QUEERFLEX was even a glimmer in my eye). Besides the group program, what other programs/activities can people access at Queerflex? Kyle from QF: SO many! Our tiered memberships account for the fact that cost is listed as a major barrier for many 2SLGBTQIA+ folks, and our most basic membership gives access to pay-what-you-can drop-in classes (including this group program), as well as sliding-scale pricing on personal and small group training, registered programs, queer-centred massage therapy, a queer and trans affirming Health At Every Size dietitian, mental health support, energy healing, and more! What can people expect from the program (i.e. what will sessions look like)? Kyle from QF: First and foremost, people can expect to have FUN in a queer-centred, body positive, weight-neutral environment. QUEERFLEX’s #1 rule is to “move at the pace of YOUR body”, and we are committed to crafting programs and workouts that will be as accessible and challenging as anyone person may need. We keep our classes sizes smaller (12-15 max) for this reason, and also so we can really get to know one another – what better way to meet new pals than sweaty and with a smile on your face? What do you want people to get out of the program? Kyle from QF: We know we can’t be all things to all people, but we want to give folks participating the opportunity to share their goals and intentions. At QUEERFLEX, we choose to focus on function and feeling, which can look so many different ways to so many different people! At the very least, we hope folks might gain new perspectives on ways to celebrate movement, connect with their bodies and grow a community of like-minded individuals! Kyle from QF: Going from 400sqft basement to 2400sqft ground-level commercial space is an incredibly exciting thing for us and our community! It means that will be able to serve even MORE queer, trans, two-spirit and nonbinary folks throughout Edmonton and Alberta; it also means we will now have space and capacity to welcome our allies to join us in celebrating our growth and connection as it relates to caring for our community’s holistic health. Allies are welcome to join us during the classes marked with an asterisk on our schedule, and we encourage them to support us by sharing our message, volunteering, and making financial contributions whenever possible. Why is the EMHC committed to this work? Alec from EMHC: We each only get one body in our lifetime so we need to care for and nurture it. The Queer Fitness Program Pilot came out of our Totally Outright Leadership Program in 2017. Attendees saw a gap in the access to physical health services in our community and took action to close that gap. Now that the Pilot Program is over, we are proud to partner with QUEERFLEX in continuing this great initiative. Where and when does the program operate? Alec from EMHC: The program takes place on Tuesday from 8-9pm, Thursday from 8-9pm and Sunday from 4-5pm. The official launch date of our program will be October 23, 2018. How do people access the program (info about the queerflex membership, pay what you can, etc.)? As a non member it is a $20 drop in fee per class. As a member of QUEERFLEX, our program can be accessed through their different membership tiers, starting as low as $5 per month, making our program easily accessible. More information on their Membership Tiers can be accessed at www.queerflex.com/membership/ . The drop in schedule is also available through the MINDBODY app and folks can sign up for drop in classes through the app.